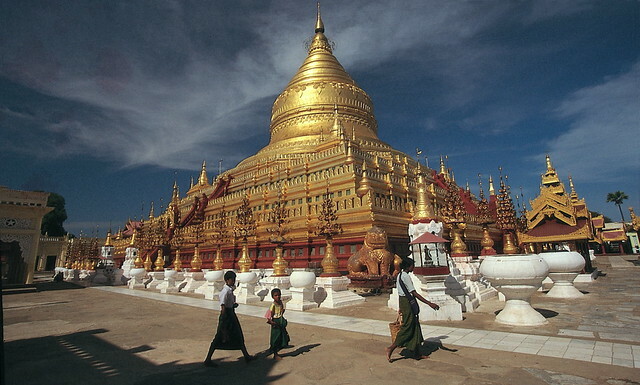 Bask in the golden glow of Myanmar. There is no better way to explore Myanmar’s golden heart than a cruise along the iconic Ayeryarwady River. Burma’s longest river, it is best known as the 'Road to Mandalay', flowing north to south from its source high in the Himalayas through some of the nation's most spectacular and scenic regions before emptying into the Andaman Sea. Navigable for about 1,400km from its mouth, in August, when the Himalayan snows melt, the water is high enough to allow vessels all the way to Bhamo, close to the Chinese border in the country’s wild north. The most accessible section of the river follows a route between Mandalay, the country’s second largest city and Bagan, famous for its temple-strewn plains. Mandalay, an important Buddhist spiritual centre, is home to thousands of monks and more than 2,500 Buddha images, mostly carved from alabaster from the Saygin Hills near Madaya. The ancient capital of Bagan, now a World Heritage site, contains around 3,000 pagodas, temples and Buddhas, including the world’s largest reclining Buddha. A particular highlight of any Ayeryarwady cruise is a visit to the Mahamuni Pagoda in Mandalay. Seemingly bathed in solid gold both inside and out, it houses one of Myanmar's most venerated religious artefacts, the Mahamuni Buddha. According to ancient tradition, only five likenesses of the Buddha were said to have been made during his lifetime: two in India, two in paradise, and the fifth was the Maha Muni or "Great Sage". Archaeologists believe the image was probably cast during the reign of King Chandra Surya, who ascended the throne in AD 146, some 600 years after the Buddha actually passed away. Little is known of the Maha Muni's travels over the next fifteen hundred years. It was stolen and moved around by various kings. At other times it was buried beneath a crumbling temple in a forgotten jungle. The image was brought to Mandalay in 1784 by King Bodawpaya and placed within the specially built Payagi Pagoda where it has remained ever since. Originally cast in metal, the 3.8M golden statue is now entirely coated with a two-inch thick layer of gold leaf. Many thousands of pilgrims travel from far and wide to visit the shrine each day, where male devotees place gold leaf upon the Buddha, believing it will bring them good fortune in this life and the next. Indeed so much gold has been applied over the centuries and by so many different hands that the figure has developed an irregular outline, leaving all but the Buddha’s face – which is cleaned daily, with a rough and knobbly surface. But the Buddha is not the Pagoda’s only attraction. In a nearby courtyard are six Khmer bronze statues - three lions, a three-headed elephant and two warriors - that originally stood as guardians of Cambodia's Angkor Wat temple. The statues of the warriors are reputed to have miraculous healing qualities and legend has it that rubbing a body part of either statue will cure an affliction in that part of ones own body. Boutique luxury travel operator, Sanctuary Retreats, offers some of the most luxurious cruises along the Ayeryarwady aboard the Sanctuary Ananda, which launched in November 2014. Custom-built using traditional Myanmar materials and arranged over four decks, this floating palace combines all the comforts of 5-star contemporary luxury with the refined elegance of authentic Burmese design. The Sanctuary Ananda offers one of the highest staff-to-guest ratios on the river, allowing guests to enjoy the mysteries of Myanmar with a choice of six itineraries led by expert guides. The vessel is also the only all-balcony (fully furnished), all-suite ship on the Ayeryarwady River, with just 21 beautifully appointed suites as well as an on-board spa, library, gallery, lounge, cocktail bar, and plunge pool. Itineraries available are 3, 4 and 7 night itineraries on the Upper Ayeryarwady River and 11 nights on the Upper and Lower Ayeryarwady River, sailing past dense jungle-clad riverbanks, grand gorges, endless rice paddies and snapshots of rural life being played out along the riverbank, including the occasional glimpse of saffron-clad neophyte monks bound for temples. While sailing along the river, guests are also treated to various unique experiences and cultural exchanges, including a visit to a local lacquer-ware workshop where gold is beaten down by hand at a speed of up to 70 times a minute into paper-thin gold leaf.